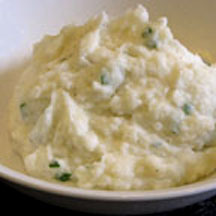 Smashed potatoes are mashed potatoes with lumps of potato intentionally left to for texture. There is no need to top these flavorful potatoes with gravy, they're perfect served as is. Peel and cut potatoes into 1 1/2-inch chunks and place in a medium saucepan, rinse with cold water and drain well. Add enough cold water to just cover potatoes and the 2 teaspoons salt; bring to a boil, cover and reduce heat to a low simmer and cook for 10 to 15 minutes or until potatoes are tender. Drain off the cooking water from the potatoes, leaving potatoes in saucepan. Add the butter and sour cream and using a potato masher or wooden spoon, mash the mixture leaving some lumps for the "smashed potato effect"; stir in parsley. Taste and season with additional salt, if needed, and black pepper as desired. Nutritional Facts Per Serving (1/6 of recipe): 297.8 calories; 41% calories from fat; 13.9g total fat; 33.0mg cholesterol; 707.4mg sodium; 935.4mg potassium; 39.8g carbohydrates; 2.8g fiber; 1.4g sugar; 37.0g net carbs; 5.6g protein.